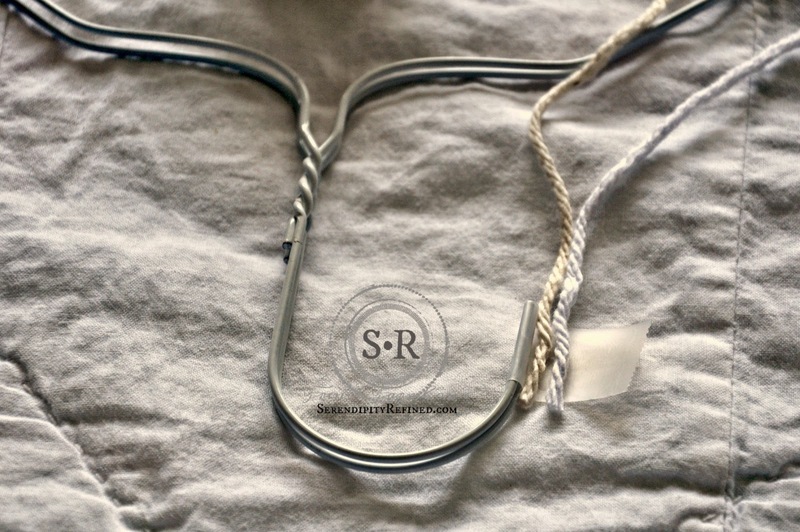 Today, I'm going to show you how to create non-slip yarn or fabric covered wire hangers. They're beautiful, nearly free, and a necessity in my home. Why, you ask? Have you ever hung up a sleeveless dress or blouse only to find it on the floor of the closet the next time you were going to wear it? Well, it used to happen to me all the time until a friend of mine gifted me my first set of yarn covered hangers 25 years ago. You may notice that I don't write a lot about organization on the blog. I blame an apparent glitch in the genetic sequence for my messiness. There must be something that that causes the organization gene to skip a generation....or at least to become recessive in first born, left handed, artists. not even one t-shirt. I had enough closet space not to have to think about it. Also I had convinced myself (in much the same way as friends convince you when they're asking you to purchase an ugly green bridesmaid's dress), that I'd "wear this again, someday". I had stuff in my closet that was probably older than some of you who are reading this or at least pre-dated your first day of school. 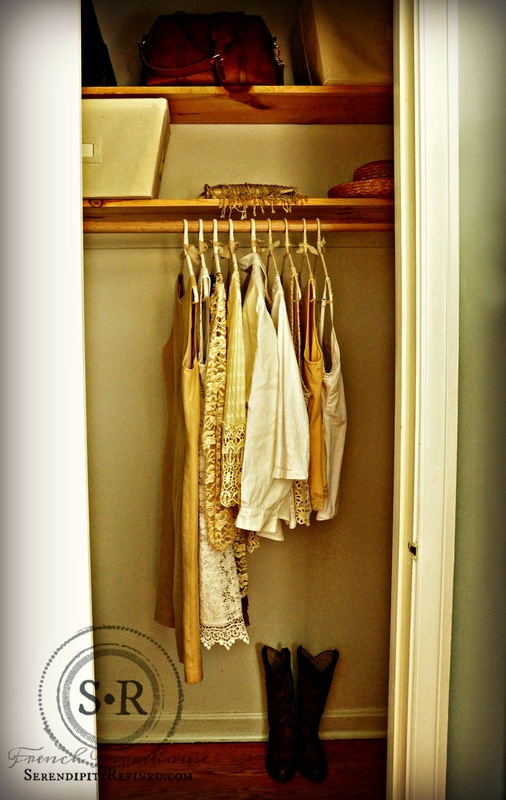 But then I moved to the farmhouse where my clothes closet is the size that one typically finds in a 1950 ranch: small. After unsuccessfully trying to jam the equivalent of two carloads of clothing into a closet which is approximately the size of a shoebox and contains one wood rod and one shelf, I gave up. I had two choices: give some of it away or spend the rest of my life pulling down a giant, heavy set of wooden stairs and going to the attic several times a year to get my clothes. I don't really like attics all that much so, I started to get organized. I say "started" because I've made good progress but two years later, I'm still not finished. There's at least one pair of jeans from high school and a sparkly gold dress that I wore to my nephew's wedding that are still hanging around for sentimental reasons (at least that's what I'm telling myself). A local charity gained most of the suits and shoes that I used to wear when I was required to work in an office every day. They will be given to gals who need a suit to wear for a job interview. The women's shelter where my son and I drop off jackets, mittens and scarves in the winter received my casual clothing and shoes. Here's where this crazy story makes a big circle and gets back to the focus of this post: As I cleaned my closet, I discovered that many of my sleeveless and string strap tops and dresses had slipped off of their hangers and were either on the floor behind my shoes or being held in place by the other clothes around them. I had to find a way to keep them on the hangers. I didn't want to spend a fortune for the cloth covered hangers that are sold in stores and I'm not a fan of the plastic ones. Since I had a pile of wire hangers from the clothes that I donated, I decided to make some yarn covered hangers using the pattern that my friend taught me long ago. Today, I'm going to tell you how to make them too! Hint: They'd also make a pretty great Mother's day gift or a graduation gift for a young lady who may be headed off to college in the fall (in appropriate collegiate colors, of course). 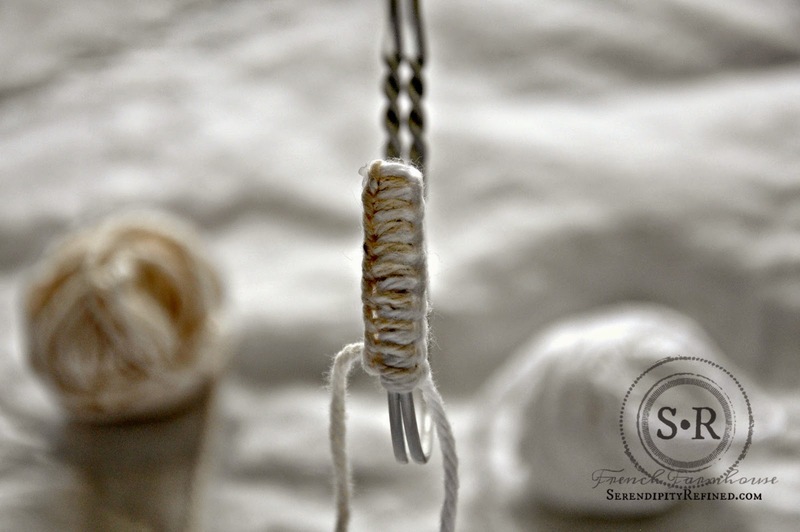 To make the yarn wrapped hangers, I used about 8 yards each of natural cotton yarn and white cotton yarn, two white wire hangers like those that you get from the dry cleaners and a small piece of scotch tape. I wind the yarn into small balls of about 8 yards each so that it's easier to work with. 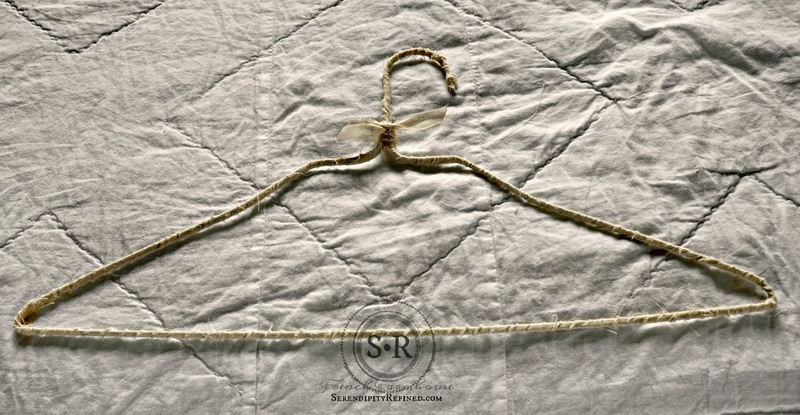 Begin by holding two wire hangers side by side (it's important that they be the same shape and size). 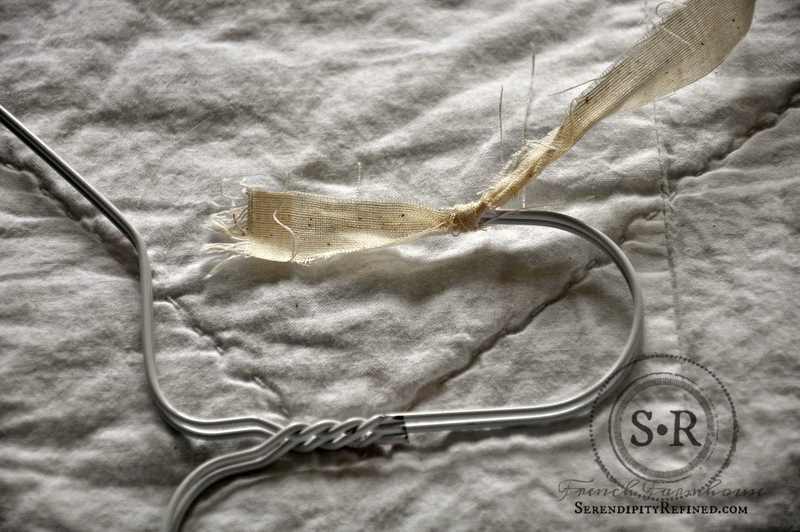 Tape the end of the hooks together using a small piece of scotch tape. 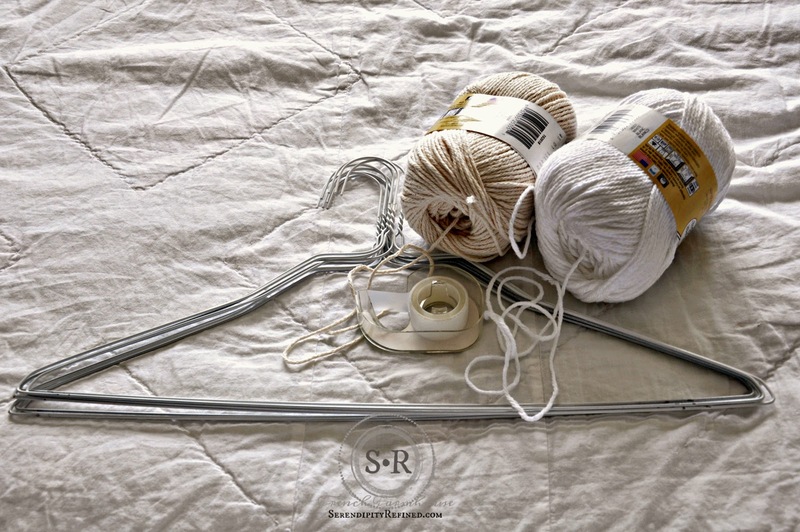 Wrap the tape around the hangers and around the yarn as shown in the photo above. I usually hold the hangers between my knees while I work on them but I couldn't get a decent shot of that so you'll just have to trust me on this. 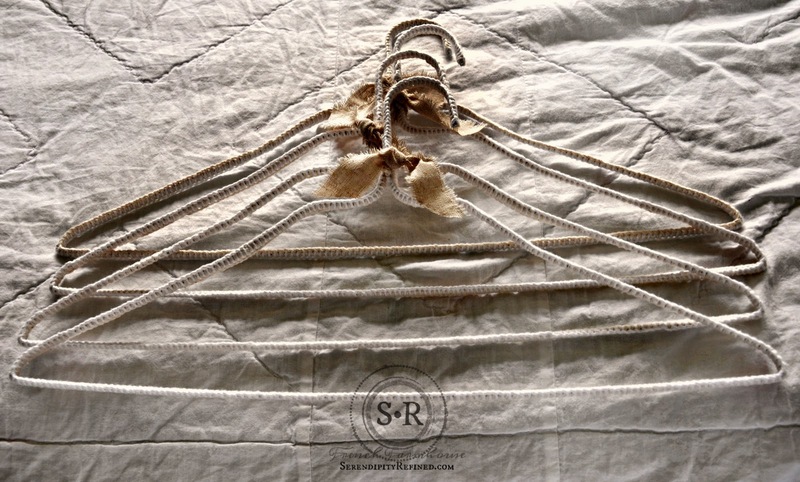 Place the hangers between your knees with the hook facing away from you. This keeps the hangers steady and allows you to work with both hands. 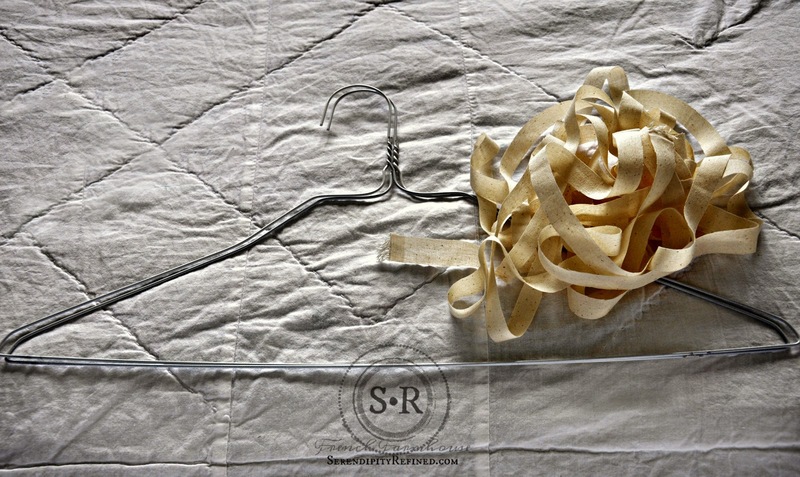 You may also want to add a piece of tape to hold the bottom of the hangers together for the first few that you make. Place one ball of yarn on each side of the hanger. 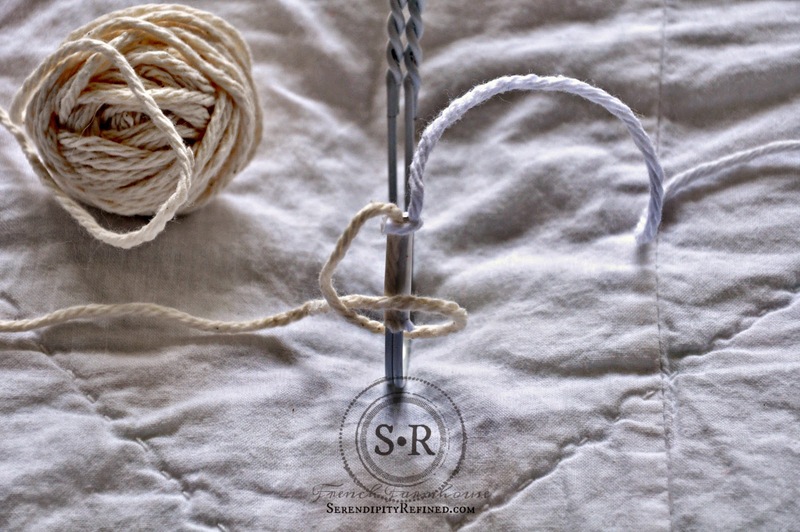 Beginning with the ball on the left, pass the yarn under the hook, around the top of the hook and back through the loop as shown above. Pull the yarn tight. Repeat the same step with the ball on the right. Alternate left and right loops, pulling tightly after each pass. 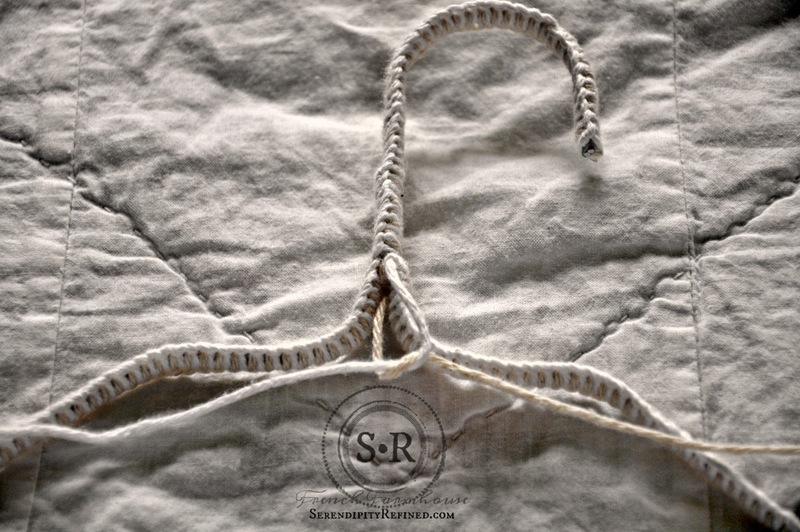 Work your way around the hanger as shown and finish by knotting the ends in the center where the hanger separates beneath the hook. Finish with a piece of ribbon tied in a bow, a pompom or, as I did, with a simple piece of Osnaburg fabric (a natural colored, loose weave cotton) tied in a square knot. I make these hangers while I'm watching television. They're sturdy enough for suit jackets, pants and dresses. 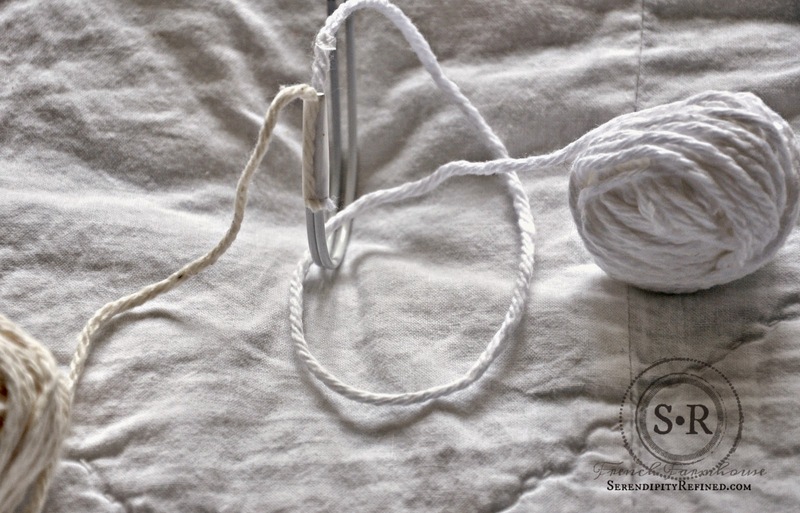 If you don't have the time (or patience) for the yarn wrapped method, there is a much quicker and easier way. Simply cut 1/2" to 3/4" strips of your favorite fabric (I used unbleached muslin that I had left over from a quilting project). 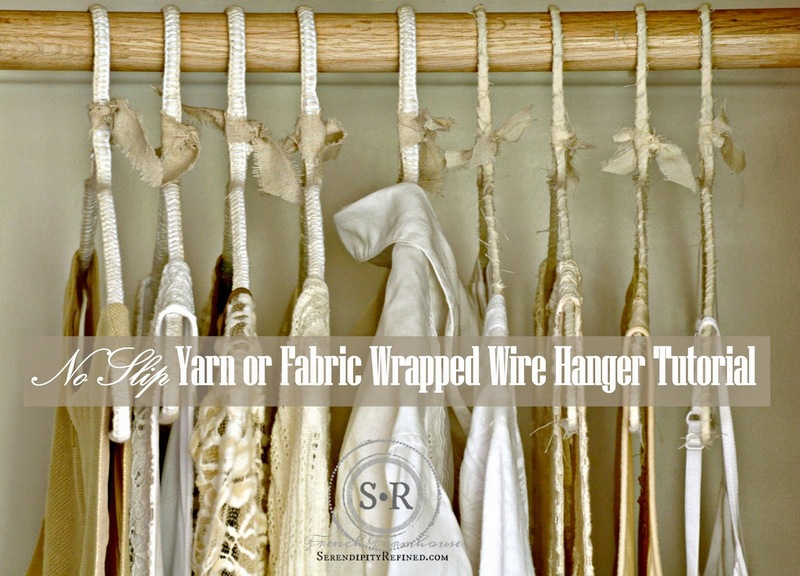 Tie a strip of fabric ribbon onto the end of the hanger. I put a drop of hot glue on the knot to hold it in place. Fold the end upward toward the hook and, with the cloth ribbon at a slight angle, wrap the hanger with the ribbon, overlapping slightly. I used 102 inch wide muslin cut into about 3/4 inch strips. Each hanger took one piece of ribbon and I made four of them in under 20 minutes. They're not quite as sturdy as the yarn covered version but work well for blouses, and light weight items. I'm slowly working my way down to about 45 pieces of clothing that will serve as the majority of my wardrobe and will fit much better in my closet. I've made myself a promise that for each new item I put into the closet, I'll remove one and donate it. 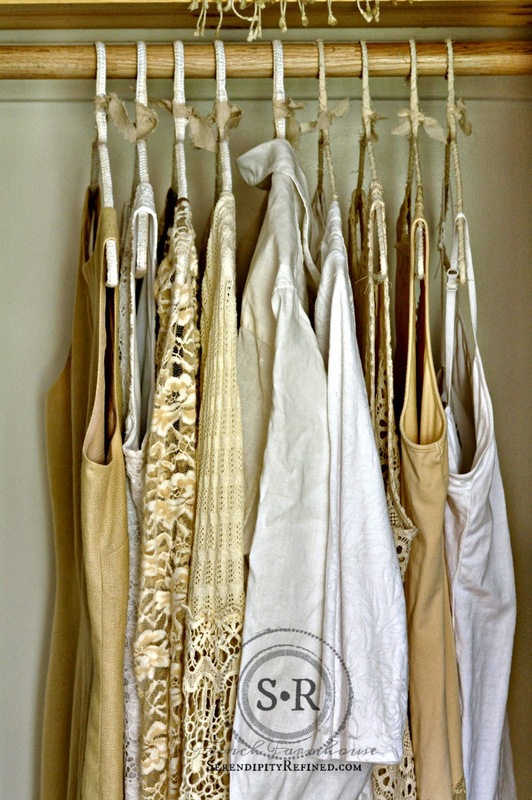 I love the way my closet looks now that it contains only pieces that I actually wear all lined up on pretty matching hangers. Because I can see the pieces, some of my favorite pieces are now in my wardrobe rotation. As for my once small, 1950 ranch house closet? It suddenly seems HUGE! Of course, what you see in these photos isn't all of my clothes. I do actually own a few things that aren't white or ivory. There may also be a piece that's pink and maybe a blue one. ....and to keep my clean clothes from falling onto the floor and ending up looking like a wrinkled mess. Although, now that the closet is clean and I can actually see the floor, that may not be as much of an issue.